Has it occurred to you that the leadership skills you’ve learned in the past 10 years and what you’ve planned for the next 5 years may no longer be relevant? Yesterday’s leadership theories and development methodologies are no longer adequate for today’s disruptive marketplace and unforgiving economic times. If that is so, why then do organizations keep accepting the same type of leadership solutions from trainers and consultants year after year? Isn’t that what Einstein calls “insanity”? I have discovered two of the main causes of the so-called leadership insanity in most organizations. First, it is because the trainers and consultants tell their client what the latter wishes to hear. As such, the boss is happy to hear that he has done no wrong while the trainer or consultant is happy to win the deal. And so, both parties live happily year after year in a win-win business relationship. The second reason is far more sinister. Selecting a service provider has become more about what’s in it for the recommender, rather than whether the service provider can add value to the organization. How are genuine service providers who don’t wish to partake in such practices going to survive in this industry? Worse still, what kind of leaders would we be producing today and in the future generations as a result of such unhealthy practices by existing leaders themselves? If the leadership insanity syndrome is prevalent in our midst, then there must be something terribly wrong with the way we think. Not just a one-off minor slip but a serious fundamental flaw that has major repercussions. A flaw so deeply rooted that it would require a radical paradigm shift and radical therapy to cure the leadership mind cancer. After more than two decades of facilitating leadership workshops around the world, as well as coaching and mentoring leaders, I am persuaded that we must develop mindful thinking and executive thinking as a foundation to curb the decline. To me, mindful thinking is the ability to gain self-awareness and to practise self-reflection. Too often, people are clueless about what’s going on deep down within themselves, that’s why they lose their way so easily. On the other hand, executive thinking is about going beyond one’s competence and capability, it’s about increasing one’s capacity to lead. 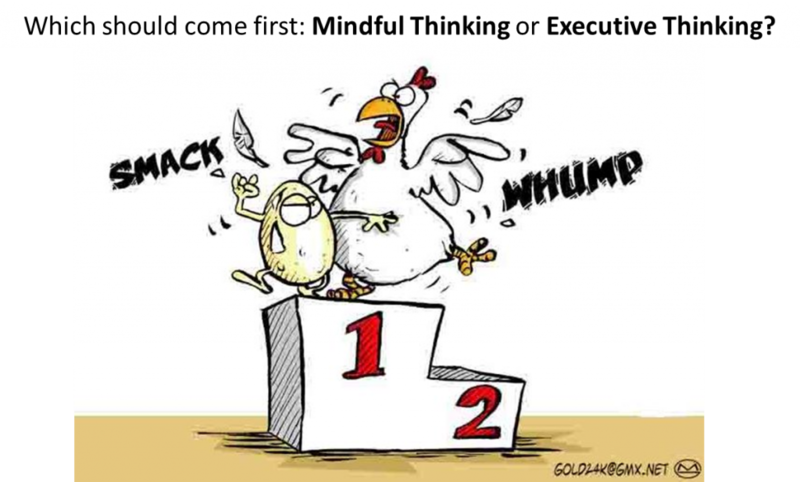 Which should come first – mindful thinking or executive thinking? Is it mindful thinking that enables us to achieve executive thinking, or vice versa? A Tribute to an INTELLECT THINKER	Stranded, Not Shaken but Stirred!